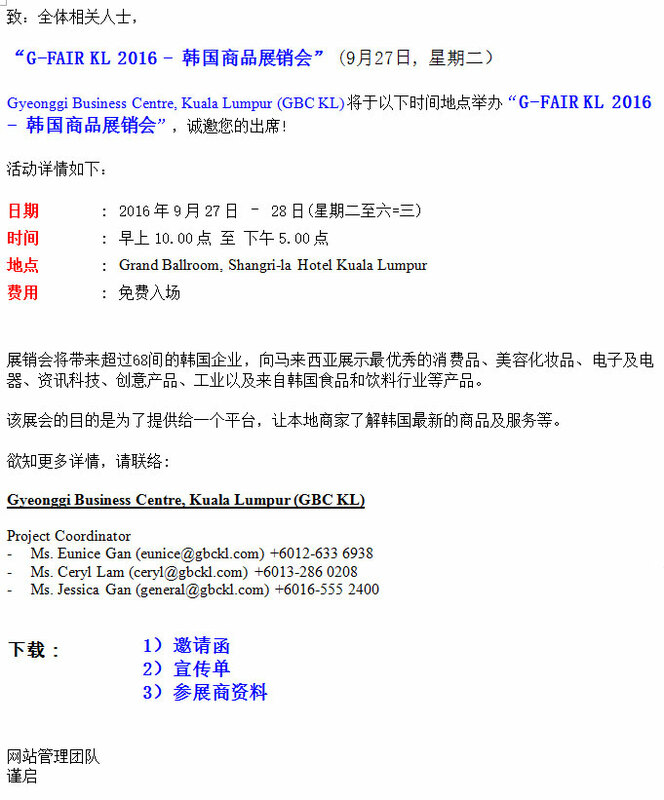 Please be informed that Gyeonggi Business Centre, Kuala Lumpur (GBC KL) would like to invite you to participate in the G-FAIR Kuala Lumpur 2016 on 27th – 28th September, 2016 (Tuesday - Wednesday). G-Fair KL 2016 is a Korea Sourcing Fair organized by GBC KL. This round, we will be bringing over 68 Korean companies to Malaysia showcasing the very best of Consumer Products, Beauty & Cosmetic, Home Appliances, Electronics & Electricals, IT, Idea Products, Industrial as well as Food & Beverage industry products from Korea. To ensure you a fruitful visit during G-Fair KL 2016, the event will organize a 1:1 trade meeting with business networking for visitor to meet with their potential partners throughout the 2-day events. The objective of this fair and meetings is to provide an opportunity for everybody who is interested in Korean’s products, to interact with one another. You will have a great platform in Malaysia to make a good business networking with them without travelling all the way to Korea.